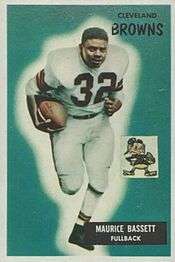 Maurice LaFrancis "Mo" Bassett (April 26, 1931 – May 24, 1991) was a professional American football player who played fullback for three seasons for the Cleveland Browns. ↑ "Maurice Bassett". pro-football-reference.com. Sports Reference LLC. Retrieved September 21, 2014.